If you want to give this as a gift, make two or three soaps to stuff in the netting that held your sand toys, then pop in a wash cloth and a net bath scrubby. I made a crab-shaped soap too, but before I could take a picture, my three-year-old found it and took it to the sink. Smile! Chop the glycerin soap into pieces and place them in a paper cup. Microwave for 30 second intervals until melted. Place the sand toy upside down on a towel so that it doesn’t move around. Pour in the soap to the half way point. Let it the soap set a little bit, then if you are using one, place a decorative button, upside down, in the center of the soap. I used a dragon fly. Let the soap set up a little more and then finish pouring soap right to the top of the mold. Now for the hard part – you have to let the soap fully harden, and then just pop it out. 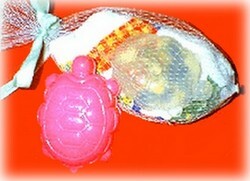 Place a face cloth, the soaps and a net scrubby inside the netting bag and tie off with some ribbon. Or just place it in the bathroom. Enjoy!